There are any number of vintage (dating from the 1950s for teddies) and antique (dating from the 1930s) teddies out there! Many are found in lofts, others have had amazing adventures, and others are being passed down the generations. Due to their age, many bears need to be repaired or restored, and Ambrosia particularly loves this sort of work! She can fix old joints, add growlers amd squeakers, add new pads and eyes, and will always do her very best to maintain the original character of the teddy. Please have a look at the wonderful vintage and antique bears which have already been treated by Ambrosia and her friends at the hospital. Ambrosia has had friends come to her from all over the world: Canada, France, Abu Dhabi, Saudi Arabia, America, Malta and New Zealand! * the teddy or animal will probably need to stay with Ambrosia at the hospital for anything from a few days to a week or so. Consequently, if a child is unable to sleep without their toy for a night or so, Ambrosia may not be able to help. If you live VERY close, and the work needed is not too extensive, Ambrosia may be able to do it in one day. But please keep in mind that an overnight stay may be necessary! * Ambrosia is not a mechanic, so please be aware that she is unable to fit complicated mechanisms that may work eyes etc! She can fit new growlers in to teddies, however. Also, Ambrosia can only work with toys that have a material structure; anything with a solid shell is beyond her healing skills! * the medicines that Ambrosia uses are very expensive, and the time it takes to make them work can take many hours. The minimum time taken will be two hours just to fix paws; larger injuries can take several hours and even days. Hence, Ambrosia starts her medicine prices at £25, and, if you need to post your teddy, you will be responsible for the cost of the travel here and then back to you again. * should the above be satisfactory, please feel free to send Ambrosia photos. If you live a long way away, you may need to post your bear or toy to the hospital. * please note that Ambrosia is unable under any circumstances, due to ethical reasons, to work with real fur, leather, sheepskin, bone or any other slaughter by-products. If bears or toys requiring medical attention are wearing any such products, please ensure they are removed before sending them to Ambrosia; it makes her extremely upset if she is confronted by such things. * if, for whatever reason, you decide that you do not want your bear or toy back following a repair, or the cost of the medicine is not forthcoming, Ambrosia will wait one month and then either put the bear or toy up for adoption on ebay, or take him or her to a charity shop so that they can stand a chance of finding a forever home. Please be aware of these conditions before making contact or sending your friend to Ambrosia. This is a story with a sad beginning, but a very happy ending. This morning, Ambrosia received a phonecall from a very distressed old man because a puppy had played a little too vigorously with a vintage Merrythought bear, and had ripped the little bear's ear and arm very badly. The teddy had been passed down through three generations already, and the man wondered if Ambrosia might be able to do anything to help the little bear. The bear was rushed straight into Ambrosia's house, where a little room was turned into a hospital, and all the bears came along to see what they could do to help. Zazu took some pictures of before and after so that people could see just how hard Ambrosia had worked with her flower remedies to try and heal the bear. This is what had happened to the poor bear's arm. All of the stuffing had been ripped out by the playful puppy. And the little bell, which had probably excited the puppy in the first place, had been happily chewed out of the right ear! ....and a slightly different one to fix the ear, and she put the little silver bell back inside. The little bear also received lovely new paw pads which had probably worn out over time from all those hugs it had given to its loving family of humans. The little bear looks almost as good as new, even thought the right ear is a tiny bit smaller than it originally was! So it was a happy ending after all. If you have a bear that needs some TLC at Ambrosia's hospital, and you like the effect of Ambrosia's magical flowers, all you have to do is get in touch and Ambrosia and her friends will do their very best to help your bear get better again. Early today, Ambrosia received another call from a lady who wasvery upset because her vintage, 40-year-old bear, Teddy, had hurt his right ankle, and there was a huge tear in it. Ambrosia told the lady to bring Teddy along immediately to the hospital. Teddy was taken in to a different room because he was absolutley HUGE and needed lots of space. He lay on the floor on a plastic sheet, and Ambrosia gave him some flowers to make him feel less scared and very sleepy. Ambrosia looked closely at poor Teddy's wound and then, very gently, began to mend his poor ankle. She pushed in some soft, fluffy, white stuffing, and very carefully began to stitch him up with a curved needle made from moon-beams. After a while, it was as if the wound had never been there at all, and Ambrosia placed some special flower herbs all over it to make sure it was fully healed. When Teddy cam round he felt so much better. Another happy ending in Ambrosia's hospital! Ambrosia has been very busy recently helping poorly teddy friends. She received another call from a lady whose lovely bear, Teddy Edgeworth, had been loved so much that his paw pad had fallen off and his stuffing was coming out! Ambrosia immediately took Teddy Edgeworth in to the hospital, made him comfy with some flower tea, and then, helped by a few of her friends, took a closer look at poor Teddy's foot. Ambrosia gathered up some lovely soft, white stuffing made out of special clouds, and carefully repadded Teddy's foot. Then she found some chocolate fleece, and made him some brand new paw pads. She re-blacked his nose and gave him a lovely, thorough brushing. And, as a special present, Ambrosia put a special rusty bell on a satin ribbon round his neck, so it would attract the fairies. When Teddy Edgeworth woke up, he looked as good as new! The bears who live with Ambrosia crowded round as they wished to hear the stories told by the old bear. As Ambrosia made him better by re-stuffing his body, head, arms and legs, stitched his ears back on, gave him some new paw pads, and sewed up the holes in his body, the old teddy told them all of the things he had seen and heard during the last 100 years. The bears did not want the marvellous stories to end! Soon the old bear was looking and feeling much better indeed, and was feeling well enough to sit looking out in to the Flowery Garden in the sun! Teddy Wriggly also had large splits on his arms and his nose had been worn away from kisses! Ambrosia collected some herbs from the Flowery Garden and made Teddy Wriggly fall asleep; then she set to work. She made him patches for his toes and arms. He felt so much better when he woke up! Then Scott contacted Ambrosia. His baby son was due in the new year and he wanted to pass his old teddy on to him. Teddy had been extremely well loved. His eyes and nose had vanished from being hugged so much, and his joints had become very loose indeed. So, Ambrosia got to work. Teddy was givem a lovely flower drink and he fell fast asleep. Then Ambrosia fixed all of his joints, and gave him new eyes and nose. He felt absolutely fantastic again when he woke up! A little later, Ambrosia was approached by a beautiful teddy who had lost his growl! So Ambrosia made him some special herb tea so he fell asleep, then went out in to the garden to catch a growl as it was passing by on the breeze. She found a lovely one, and put it in to his tummy while he slept. She also gave him a lovely brush, and when he woke up, he was so pleased he didn't stop growling for a very long time indeed! Not long afterwards, Ambrosia was contacted by Brenda, who wanted her lovely Toffee bear to come to the hospital. Poor Toffee was in rather a bad way, for he had been loved so much! So Ambrosia put Toffee in to a lovely deep sleep with some special flowers. She mended his poorly ear, his poorly left paw and his right foot; she gave him a new right arm, and he had a new growl put in to his tummy as well! Ambrosia also gave him a special bell on a ribbon so that, whenever Toffee wanted to play with his new friends, he only had to ring it! When he woke up, he felt splendid again! Lots of bears have been visiting Ambrosia's hospital recently. Just a few days ago, Paul brought in Trevor, a bear who had had his head pulled off by a naughty child! Trevor had also lost an ear and his growl. So Ambrosia made some special flower tea for Trevor, and, while he slept, she put his head back on, made him a new ear, and gave him a lovely new growl. He felt great when he woke up! Then Maria contacted Ambrosia with a very beautiful, old bear who needed lots of love. So Ambrosia made the lovely teddy all better and gave him a magical bell on a ribbon! Then Toffee's friend, Growler, came to stay with Ambrosia, as he wasn't feeling well, either. His hands and feet were sore, he had no nose (Ambrosia got to work straight away and forgot to take a photo sooner!) and he had lost his growl. And then she was given a new leg, and lovely new paw pads all round! She felt wonderful when she woke up! So Ambrosia made the bear a magical drink and he fell fast asleep. While he slept, Ambrosia mended his poorly leg, made him some new paw pads, put a brand new growler in his tummy, stitched him a new nose, brushed him, and put a rusty bell on a ribbon round his neck! He felt wonderful when he woke up! So Ambrosia put the teddy to sleep with some special flowers. Then she made him a new head and ears; she put back his original eyes; she put a new growler in his tummy; she washed his lovely woolly vest, and she gave him a new bell and ribbon. Teddy felt so much better when he woke up! He was also having problems with his hip and ear, and his growler had died ages ago! So Big Ted had a lovely sleep while Ambrosia worked her magic. A new grolwer was put in his tummy and his torso was re-stuffed. His head was secured and his ear sewn back on. His arms and legs were re-stuffed and the tears all sewn back together. And then he had new paw-pads, new claws and a new mouth. He felt wonderful when he woke up and foiund he also had a rusty bell on a ribbon! Ambrosia loves it when other animal friends come to stay at the hospital, and she was honoured to admit two very old hobby horses! They had been stuck in a loft for thirty years and needed quite a lot of attention. They were rather grubby after being loved and lofted, their ears were coming off, there were holes, and they felt dull. So the two horses fell fast asleep after eating some magic flowers, and Ambrosia nd the other animals and bears got to work. The horses were washed, stuffed with brand new, soft clouds, and had lovely new eyes made for them. Their ears were stitched back on, their holes swen up, their manes brushed and, finally, they had some beautiful satin rosettes to make them them look beautiful again! Then a lovely teddy arrived who was 54 years old! He was in amazing condition, but still needed new paws and a bit of a tidy-up. So Ambrosia worked her magic while teddy was asleep. Whe he woke up, he felt wonderful again! And here are Big and Baby sunning themselves! Teddy really felt quite wonderful at the end of it all! And it was very sad indeed when Night-time teddy, who is 69, came to stay after being played with too roughly by a dog! Poor teddy had lost his entire face and wasn't feeling very good at all. So poor teddy was covered in flowers to make him fall asleep, and Ambrosia set to work. She took out his old stuffing and gave him a lovely wash; then she stuffed him again with brand new clouds; then she stitched up the odd tear. Ambrosia also awarded Night-time Teddy a bell on a ribbon for being brave, and she dressed him in the clothes that had come with him. He looked so much better! Ambrosia was delighted when another tiger friend of Big and Baby, who she helped a while ago, arrived. Moth had been loved so much that the side of his face had been worn away with kisses! So Ambrosia worked her magic and soon Moth was feeling much better. 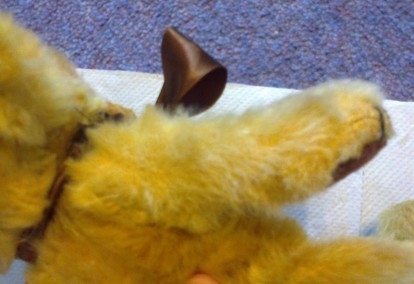 And yet ANOTHER poor teddy that had been played with by a dog arrived at the hospital! Ambrosia and her friends were very sad indeed to see the state of this poor teddy, who had basically lost his face, and had had his left ear torn to pieces. So Ambrosia put him to sleep with her magic potion, and made him a new face. She sticthed up his poorly ear, gave him a brush, and awarded him a bellon a ribbon for being so brave. He felt wonderful afterwards! Ambrosia loves it when especially old teddies come to the hospital for a visit, so it was a pleasure to meet a teedy who was at least 60 years old! His hands and feet had totally disintegrtaed, his right ear was falling off, his torso was floppy, his nose had come undone and he had lost his growl. So Ambrosia and her bear friends prepared their special sleepy brew and, once teddy was fast asleep, they got to work. His ear was stitched back on, his nose was re-stitched, he had a new growler and a re-stuff, and his poor paws were made all better. Teddy had been so brave that he was given a special rusty bell on a satin ribbon. Here he is, waving to say hello! So, Ambrosia made teddy a special, flowery drink and he soon fell asleep. Then Ambrosia and her friends made teddy a new muzzle, and gace him new paw pads. Because he had been so brave, teddy woke up to find himself having been awarded a rusty bell on a stin ribbon! He felt lovely! And then came another teddy who didn't feel well at all. His paw pads were coming off, his nose had gone, and he was covered in tears and seams that were coming undone. Ambrosia made him a flowery drink and he fell asleep. When he woke up, he felt lovely again. He was awarded a rusty bell on a ribbon for being so very brave! So Ambrosia set to work. Teddy fell in to a lovely sleep. Ambrosia gave him new paws, a new nose, a new eye, mended his poorly leg, fixed his ear, gave him a growl and gave him a big cuddle because he had been through so much. Then she awarded him the bell of bravery on a red ribbon. Teddy felt fabulous!!! It was another exciting day when yet another wonderful, vintage bear arrived at the hospital. Mickey, who is 61 years old, didn't feel good in the slightest. His paw pads were coming off, he had lost his growl, and his back and head were sore. When Ambrosia had carefully removed the backing material, she found what looked like the scars of an accident. Ambrosia was later informed that poor Mickey had been thrown on to a fire by a naughty boy! So, while Mickey slept, Ambrosia, with the help of the other bears, carefully made Mickey better. They put in a new growl, mended his poorly back and head, stitched his ear back on, gave him new paw pads, stitched up some loose seams, embroidered a new nose, and, because he had been so very brave, awarded him the rusty bell on a red ribbon! Mickey felt fantastic again! The bears were delighted when Bobby bear arrived. He was vey old and feeling the worse for it! He had lost an eye, his growl, and his torso was all floppy. Even his pads were coming off and he had a few tears. So Ambrosia made her special potion and Bobby was soon fast asleep. She gave him a new eye, new pads all round, put a new growl in his tummy, and stuffed him with clouds so he could sit up comfortably again. His rips were sewn up and, when he awoke, he found he had been awarded the bell on a red ribbon for bravery! He felt lovely again! Ambrosia was delighted to meet a lovely old bear, Edward, who was in need of a bit of help. His ears were either off or coming off, and his paw pads were falling to pieces! Poor Edward! So, once Edward was fast asleep, Ambrosia got to work. She stitched his ears back on, embroidered him anice, new nose, and made him new paw pads all round. He looked very handsome when he woke up! The next teddy to arrive was in an awful state. A large, 48cm high, mohair bear who was at least 60 years old, he had been locked away, all alone, in a dirty garage for many years and felt terrible. He was absolutely filthy, his left leg was all bent, he had lost his growl, and his eyes were on a string round his neck. He was very sad indeed. So all of the bears got together to help poor teddy. He was un-stuffed, washed, re-stuffed and then had a new growler, new pads and claws all round and had his eyes put back in. When he woke up he told them that he had no idea where he had been or even who he was any more. He knew he didn't have a home to go back to, so the bears asked him if he would like to stay permanently at Ambrosia Place. The bears drrssed him up in an antique Victorian baby's bib, and added a little wooden tag with a bell and stickers to celebrate his residency! He was delighted! Ambrosia and her friends love it when really old bears arrive. The next one was 60 years old and was wearing extremely well for her age. She was, however, totally re-stuffed after being washed, and was given lovely new paw pads. The little bear loved it so much at Ambrosia Place and, having no-where else to go, she was delighted when the bears asked her to stay with them forever! She was dressed in a little bear collar with a bell, and given a little wooden tag with stickers and a bell. She was so happy! Then an extremely old teddy arrived who had no idea he was about to change colour! He needed a lovely wash and re-stuff, and he looked pretty amazing afterwards! And now comes perhaps the saddest of all of the Ambrosia Hospital Stories. A week ago, the bears at Ambrosia Place were devastated to find a teddy outside under the bushes by the front lawn. The poor teddy was barely conscious; he had dragged himself for many miles to get to the hospital and was nearly gone. The bears brought him inside as quickly as possible and it was the first time the bears ever saw Ambrosia cry. The poor teddy had no hands; his feet had been sewn together across the pads so he was unable to walk properly and his legs were all buckled. He had a huge rip in his tummy, his ear was ripped at the back and he was damp. They gave him an absolutely huge magical drink and he fell in to the very deepest of sleeps. The bears had to be really drastic for the first time ever, and the teddy was completely taken apart. Even his joints, which were rusty and damp, had to be removed and his eyes were taken out. The poor teddy was too far gone, and some of the bears thought it might be best just to let him rest now. But Ambrosia never, ever gives up. She washed the material, she cut out the mouldy bits around the joints and put in patches. She put his eyes back in. Then she gave him lovely new joints. Next, she re-stuffed him with fresh clouds, and stitched up his poorly ear, his tummy and she gave him new hands and feet. Ambrosia had never worked so hard in her life on such a desperate case. The poor teddy had a dirty sack with him and in it was an old, ripped jumper; it was the only thing he had in the whole world. Ambrosia washed and mended that, too, and gave him a special wooden tag with a bell because she loved him so much now. She dressed the bear and, after a few days, he woke up. He felt like a new bear. He had absolutely nowhere to go, and the bears simply let him stay; they didn't want the bear, which they named Pudding, to leave them ever again. Pudding follows Ambrosia everywhere; they are always together. And then a really old bear arrived! The family he lived with thought he was about 90 years old! He had lost his eyes, an ear, his growl, his pads, and he was also about to lose his head as it was very loose. There were loose seams and areas which needed stuffing. Ambrosia needed all the bears' help on this one; Pudding was there, as always, doing his very best to make the new bear feel safe and happy. Pudding made the flowery drink and the bear fell fast asleep. His head was secured, as were all his other joints; he was given a new ear, new eyes, and a growl. He also had new paw pads, and stuffing in parts where he was collapsing, and other things were done to make him feel better. His old ribbon was washed and wound with a new one. He looked gorgeous afterwards! And then another extremely sad case appeared; teddy had heard about the hospital and had walked all the way from a rubbish tip where he had been left. Pudding was the first there to give him a hug and bring him inside. He was given some bread and honey and some herbal tea, and then the bears set to work. Pudding took over from Ambrosia this time, and had a really good look at the new patient. He was all floppy and his poor paws were ripped and sore. When the bear was fast asleep, Pudding took out all of his old straw stuffing and gave him a lovely wash. Then he filled him fulll of new clouds, mended his poorly paws and gave him a new nose, mouth and claws. The teddy, when he woke up, said he'd had a lovely dream and that his name was Winterbourne. He felt really sweet afterwards; but, he said, he had no-where to go. The bears simply asked him to stay! Winterbourne was absolutely delighted and couldn't wait to help out at the hospital with Pudding. The two are never far apart now. And then a lovely old bear arrived who was feeling extremely floppy. He was a Pedigree bear from the 1950s and was full of horrible foam. So, when he was fast asleep, Ambrosia removed the foam - which had disintegrated - gave him a lovely wash, and re-filled him with brand new clouds. Teddy felt splendid when he woke up! Then a realy special little bear arrived. He was over 75 years old. He'd been with two children during World War 2, and was their best friend. This little teddy evacuee found his way to the hospital as he was feeling rather old, but he was in amzing condition considering his adventures. Pudding stroked his little head as he fell asleep, and, when he was spark out, his old stuffing was removed; he was washed, and was filled with new clouds. His little nose was re-embroidered and the bears managed to source some replica World War 2 identification for him. He simply stayed at the hospital with the other bears as he had nowhere else to go, and they called him Teddy Edward. And then an absolutely gorgeous Chiltern teedy called Fred arrived. He had been loved and loved so much that his pads were worn through, he'd lost his growl and he was all floppy. So, after he'd ahad a rest in the conservatory, he fell fast asleep having drunk a special potion. Ambrosia and the other bears got to work and put in lots of new clouds as well as a brand new growl. He was given lovely velveteen pads and a massive cuddle. He felt fantastic afterwards! And then what was believed to be a true peice of British teddy history arrived! Julie said the teddy was at least 80 years old and that she would love to know a little more about him, so everyone set to work. First of all, he was given an assessment to find out how the poor chap could be helped. Oh dear! His right arm had fallen off, his right leg and head were only stitched on; his left arm was all floppy, his ears were coming off and his paw pads were very grubby and needed replacing once more. So, when the antique teddy was fast asleep, the bears got to work. His poorly limbs and head were re-jointed and re-attached; he was given lovely new pads and his claws were re-stitched. His button eyes were fastened on more securely, as were his ears, and his nose was re-stitched. He looked wonderful when he woke up. The bears were even more delighted to discover that he was, in all probability due to certain indications, that he was possibly one of the earliest British bear prototypes from 1912! Here was a real piece of history right before them! The way teddy's ears had been pushed in to the facial seams, the fact that he had a lead-weighted reed growler, his shape, and other pointers, suggested he was, indeed, one of the oldest bears in England! And a week or so after he returned home, Lord Teddington - as he is now called - was kind enough to send the bears a lovely photo of himself all dressed up! Doesn't he look grand? And then another sweet vintage bear arrived. She was basically flat; the dreadful foam inside her had completely degraded and she wasn't feeling very well at all. So the bears made her all sleepy and then removed the rest of the dusty foam, gave her a lovely wash and filled her full of brand new clouds. She was then given a sweet dress and hair bamd, and asked if she could remain at Ambrosia Place to help out. The bears were overjoyed that there was another new friend amongst them! And then another very special bear arrived; he was over 50 years old and the bears decided he was a Pedigree due to numerous clues! 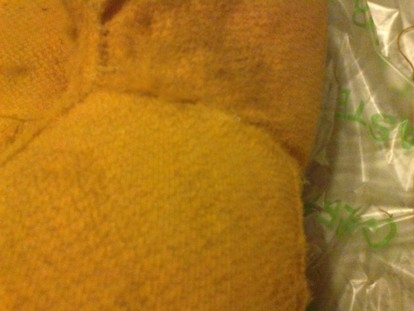 The teddy needed a few holes in his chest stitching up and new paw pads, as the stuffing was falling out of his left leg. When teddy was nicely asleep - having drunk one of the special herb potions - everyone got to work. Some bears cut out the patches while others helped weave up the holes in teddy's chest. Soon he was all done; he felt lovely when he woke up. Here he is giving you a wave! And the bears were overjoyed when yet another beautiful Chiltern came for a visit! Poor teddy had been so loved that his pads were worn and his left paw had disintegrated. He had also lost his growl and had quite a few holes. The bears got to work as fast as possible. When teddy was asleep, they made him lovely, new, velveteen paw pads, and re-stitched his claws following the original Chiltern design. He was given a new growl, had his holes sewn up and extra excelsior stuffing was put in to his limbs to plump them out again. He felt great when he woke up and growled and growled with pleasure for ages! 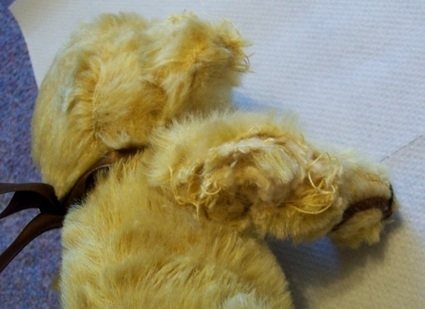 And then another poor vintage teddy arrived; he was in an awful condition. 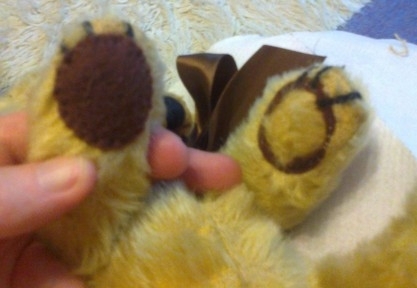 His paws had worn away almost completely and his stuffing was falling out. He'd even lost his ears and he wasn't feeling very good at all. So, when he was asleep, the bears took out all of his excelsior stuffing, washed him, re-stuffed him with clouds and steel shot, and made him new ears. Then he was given new pads and claws. He felt lovely when he wpke up. He was awarded a lovely colar and wooden tag. He was named Sir Honey because of the beautiful colour of his coat. He decided to stay at Ambrosia Place and help out at the hospital! There was a huge party to celebrate! And it's especially exciting when very old teddies arrive - particularly when their owners have no idea how old they really are! The bears welcomed the new arrival and then Ambrosia started to gasp! Here was what she believed was a late 1920s Chiltern - one of the earliest of this sort of teddy! She could hardly believe her eyes. The long snout, the slight hump at the top of his back, and several other clues drew Ambrosia to this conclusion. So she set to work to make Harriet (for that was his - yes, his - name!) look as he would have done so all those years ago. Harriet was stuffed where he needed it with the approipriate material, was given new pads - carded on his feet - and claws in the correct design. He was given new glass eyes and his face was made all sweet again. He looked absolutely fantastic when he woke up! Harriet continued to make an impression at Ambrosia Place. He insisted on helping Ambrosia with the washing up; afterwards, he ran off to make friends with the fish! And then yet another startling find turned up! This poor teddy looked as if he had been in the wars, and the possibly is that he did! The poor bear had lost his original eyes, his right ear was stitched on all wrong, his pads were a bit of a mess, his face was all sore and he was a bit floppy all over. When he was snoring soundly thanks to the flowers, the bears set to work. Teddy Edward was given new glass eyes and his ear was stitched back on correctly. He was re-stuffed where he needed it and he was given a growl, even though his original squeaker was put back in his tummy. He had lovely new pads and claws, and his poorly face was made better. When he was finished the bears just stared. They were sure that Teddy Edward was a 1930s/40s Merrythought! Teddy Edward had also brought along his friend, another poor friend who had been played with by a naughty dog. 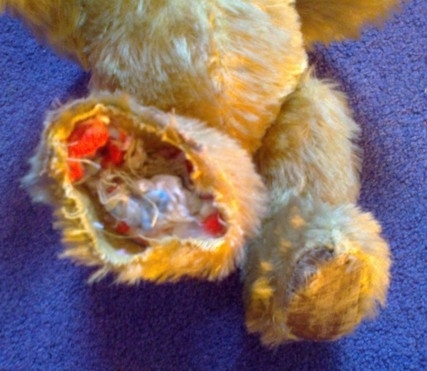 Teddy's arm had been ripped off and was in shreds in a bag. He felt very sorry for himself. The bears made him a lovely flowery drink and he was soon snoozing. They all tried their very best to piece the arm back together; it was one of the hardest puzzles they had ever had! Soon the arm was back on and teddy was so pleased again when he woke up! And it was a sweet surprize when a very old giraffe arrived. The bears thought she must be at least 80 years old. She had lost an eye, her right ear was hanging off and her neck was all floppy. When the giraffe was asleep, the bears removed all of her old stuffing and gave her a lovely wash so she would smell sweet again. She was filled with steel shot and new clouds, and her neck was made all strong again, and her ear was secured. She was given new glass eyes. The bears called her Daisy and asked if she would like ot stay at Ambrosia Place as she had nowhere to go. They had a huge party whe she said yes! Then an absolutely massive teddy - at 3ft tall - arrived! He had been in a garage for quite a while and needed some help. He was floppy and had a few hioles, and his claws had come off. When he was fast asleep, the bears carried him outside in to the flowery garden because he was so huge and they needed room to work! Tedy was re-stuffed so that he could lift his head. He had a new growl put in, his holes and loose seams were mended, and his claws were stitched back as they had originally been. The bears gasped when they saw him all finished, as they were sure he was a 1930s Chiltern! What a lovely surprize for teddy's owner! The bears were delighted when yet another Paddington arrived! This one had grubby face, hands and ankles, and his fur was all flat. He needed just a bit of help. So, when he was snoring, Ambrosia completed the transformation. He felt splendid when he woke up! And then two bear friends arrived. Little Brown Ted had certainbly had some adventures during his 65 years and was quite despertate. When he was snoring away, the bears got to work. He was given new stuffing where necessary; he had lovely new paw-pads and claws, was given new eyes and his little nose was re-embroidered. There were several loose seams and holes that Ambrosia touched with her magic to seal them up. Brown Ted felt ready for the next 65 years when he woke up! And Brown Ted's best friend, Nounours, also needed help. Nounours' left eye had sunk completely in to his head through a hole, he had lost his growl, his pads were hanging off at the wrists and all felt tatty, his nose had been kissed off and his ears were all ripped. Poor Nounours! So the bears all got to work. When Nounours woke up, he gave a massive growl with his new voice and gave everyone a wave! Doesn't he look handsome? And then a really beautiful little Chiltern from the 1960s arrived. She was very dirty, had a ripped arm and was just feeling really awful. She'd walked all the way to Ambrosia Place ahving heard about the bears as she had no-where else to go. The bears gathered round and gave her a huge hug. Then, when she was fast asleep, they gave her a special wash. She was filled with soft clouds and buckwheat scented with nag champa. She felt incredibly different when she woke up. The bears called her Goldilocks because of her renewed colour and asked if she would like to stay with them at Ambrosia Place. They had a huge party when she said yes! The bears had a lovely surprize when five - yes, five! - Paddingtons all arrived together! They were a lively bunch who needed a bit of a wash and brush-up. The bears got to work and had lots of bubbly fun! They felt so much better afterwards! Then an extremely special pair arrived. Teddy and Bunny had been together since 1918/1920 and were simply in need of a home. Ambrosia Place threw its doors open to such a couple! Teddy needed quite extensive restoration and, when he was fast asleep, the bears took a look at him. Both arms and his right leg were sewn to his body so they couldn't move; his left hip was open and his feet were filthy and wearing through; he had no ears, his eyes were falling out and his nose had been kissed away by Bunny. Bunny never left Teddy's side for a single second throughout the entire restoration process; they were carried about together as it just wouldn't have been right to separate them even for a minute. Many, many hours later, the arms and leg were moving, his poor hip was all better, he had new paw pads, and he could hear, see and smell again! Little Bunny just needed a quick brush and cuddle. The pair were overjoyed when the bears asked them to stay and there was the biggest party ever! Teddy and Bunny looked forward to spending the next century together. And then a very special teddy arrived. A gentleman had hand-made him for the lady he loved 45 years ago while he was in hospital and she a student nurse. Lorna and Darrel have been married now for 45 years and teddy was feeling a little worn from being loved so much. He was very dirty, his right arm and head were now only stitche don, his pads were worn away and his heart had fallen off. The bears got to work immediately. Teddy was washed, his head and arm were made better and re-attached properly, he was given new pads, new glass eyes, a new nose and his heart re-appeared as if by magic! He felt absolutely fantastic! And then another truly amazing repair arrived. Helga sent her lovely monkey to Ambrosia to help. During WW2 a gentleman came over from Poland to fight with the Allies as he had lost his entire family to the Russians. He fell in love with Helga's grandmother and stayed in England. This man gave monkey to Helga and she has only just managed to be re-united with monkey after 40 years. His right leg was off, his ears were gone, his tail-seam was open, his paws were split completely and his face was falling to pieces. When he was fast asleep, the bears set to work. When he woke up again, he felt bright and fresh and ready to go home to Helga and never leave her again. And Helga was kind enough to send photos of her and monkey then and now! Then a very large Chad Valley called Uncle Eck arrived. He was in quite a state, having spent years in a black bin-bag at the back of a wardrobe! His pads were worn, he was blind, his nose and mouth were fast disappearing and he was floppy. So, when he was fast asleep, the bears had a good look and began their magic. Uncle Eck was plumped up with excelsior stuffing; he was given new glass eyes, a new nose and mouth were embroidered following the orginal needle-holes, he had new pads and was given a lovely new growl! He felt all ready to meet life head-on again - out of the wardrobe! - when he woke up. Then a tiny bear arrived who was looking rather bad indeed. His muzzle had been kissed off and his owner had attempted to fil the hole with glue; he felt awful and couldn't breathe. So Ambrosia set straight to work! When teddy was fast asleep, he was given a new muzzle and a sweet nose and mouth were embroidered. He felt absolutely fantastic when he woke up! Then an extremely distressing case arrived. A tiny lamb was heard bleating at the front gates of Ambrosia Place and the bears rushed out to see how they could help. The little lamb had a huge rip in her face and was feeling very sorry for herself; she had run away from a farm (only bad people eat meat) and had nowhere to go. So the bears immediately took her in and began to help her. She was given a flowery drink to ease her distress and, when she was fast asleep, they worked their magic. She was washed and restuffed and Ambrosia spent many hours weaving her a new face. She was given new inner ears, mouth and nose and lots of holes were sewn up. She showed them her label; she was a very rare Dean's Rag Book lamb! They called her Primrose and she stayed with them at Ambrosia Place, and they had a huge party to celebrate! The bears love it when antique and vintage bears from different makers arrive, so they were thrilled when a Farnell came for a visit! Peter wasn't feeling well at all. He was blind, his pads were coming right off, he was floppy and could neither smell nor speak. So the bears got to work straight away. When Peter was fast asleep, he was given new glass eyes, a new nose and mouth, lovely new felt pads, claws and stuffing to help him feel a bit more plumptious. He was a very proud Farnell bear when he woke up. Doesn't he look smart? Then Diana brought along a teddy from the 1950s. He was grubby , his head was all wobbly and hanging off and his right arm had become all floppy. So, when he was snoring happily, the bears cleaned his fur, secured his poor head and re-filed his arm. He felt quite a lot better when he woke up! And then a really dreadful case arrived. 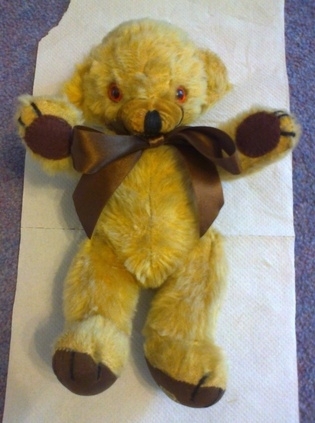 The little bear, who was obviously a beautiful Chiltern, had dragged himself all the way from a rubbish dump to the hospital hoping someone would be able to help him. He was desperate. He was filthy, he'd lost an eye and his nose and mouth were practically gone. His paws were sore and ripped and he was in tears when they helped him in. The Ambrosia bears gave him a warm blanket and then a long flowery drink so the poor bear fell asleep. Then they had a really good look at him and set to work. They called Pudding (another Chiltern who they thought they had lost) as he had been in a similar condition. Pudding didn't hesitate. He took out the little bear's old wood stuffing anmd washed him gently. Then he filled the bear with new clouds and steel shot. Then he carefully mended his paws, and gave him a new eye, nose and mouth. Pudding never stopped once until he was sure the little bear had bene saved. To make sure the little bear, who they called Bastian, was never cold again, he was given a beautiful jumper. He never leaves Pudding's side. Then a very distressed bear from the 1950s arrived; he had lost his head and his paws were a bit worn. When he was snoring peacefully, the bears, including Bastian, made him all better. They re-attached his head and gave him lovely new corduroy pads. He felt lovely when he woke up. Then a very old poodle arrived; she wasn't feeling very sweet in the slightest. Her muzzle was sore, she was dirty and she neededa bit of help. When she was asleep, the bers did their best to make her feel better. They gave her a wash, added stuffing where it was needed, mended her ripped ears, and made her face and muzzle all better again. She felt lovely when she woke up! And then a lovely little Chiltern rang the bell. He was in a state. His paws were ripped, his stuffing was coming out of his legs and head, he was blind and he'd lost his growl. When he was snoozing away, the bears gave him new eyes, new stuffing in his head and limbs, and a new growl. He also had lovely new paw pads. He looked fantastic when he woke up! Ambrosia was so excited about the arrival of a tigress belonging to a 91 year-old gentleman, that she completely forgot to take a 'Before' photo! The poor tigress needed help with a floppy tail and her inner leg seam was totally split. Ambrosia added stuffing where it was needed and stitched up the gaping hole. The tigress felt lovely afterwards and still requested that her photo be added to the site! And then a really sad case arrived. The gorgeous Chiltern was in a state. Poor Duke's left arm had practically disintegrated, he'd lost his growl, bits of stuffing had clumped and his claws were unravelling. He felt really awful. The bears got to work on him immediately. His poor arm was too far gone so, when he was asleep, the bears made him a lovely new one. He was given a fierce growl, holes were stiched up, stuffing was added and he was given lovely new claws. He felt splendid when he woke up! And then the most gorgeous little Chiltern arrived! She was feeling very bad, however, as she had nowhere to go and was very lonely. The bears immediately welcomed her and gave her fairy cakes to eat and sparkling fairy water to drink. When she felt better, they had a good look to see how they could help her. She fell fast asleep (Ambrosia had put some special flowers in her drink) and they set to work. The little bear had all of her dirty stuffing removed and was washed. She was filled with clouds and buckwheat scented with nag chanpa. Her burnt poor sprouted a daisy and she was given a quartz crystal necklace. She looked so sweet when she woke up. She asked if she could stay with them. Of course they said yes! They were overjoyed that another bear had joined then. She was called Peace and they had a huge party to celebrate. And then a sweet little bear arrived who needed a bit of attention. The little teddy had lost her voice and her right eye was falling out. Not long afterwards, she was able to growl again, and her eye felt all better! And then an extremely distressing case arrived. Poor Timothy Bear was falling to pieces. He had been living on a windowsill and was damp and covered in holes; his right arm was literally hanging on by a few threads, his eyes were coming out and he had lost his voice. He just did not know what to do. So, when he was fast asleep, the bears set to work. He was given lovely new paw pads all round; then his eyes were re-placed, his holes were patched, his face and muzzle were fixed, he was given a new voice, his right arm was properly re-attached and he had a new nose and mouth embroidered. Phew! What a lot of work, but he felt so much better afterwards! Timothy's best friend, Mary, was kind enough to send Ambrosia a photo of him when he had been reunited with the rest of his friends! Then, shortly afterwards, Timothy and his family moved to the South of France and he wa skind enough to send a photo of himself and Leo sunny themselves! It was a lovely surprize when a Dean's Rag Book bear arrived; the bears hadn't had a visit from one since the little lamb who had stayed with them after her restoration. This chap, called Whiskers, needed a bit of help regarding his right foot, his nose and a hole by his left joint. When he was snoozing away, the bears made him all better. He looked very handsome afterwards! And then a truly amazing restoration project arrived. Strictly speaking, Clarence was obviously not a teddy but he was a beautiful vinatge golliwog who thoroughly deserves to be on this part of the site. Clarence was feeling less than his usual dapper self, and needed a completely new outfit and some re-stuffing. The bears set to work. After days and days of careful re-covering, Clarence found himself looking absolutely wonderful and all ready for his up-and-coming minstrel show! He'd even decided to have new facial features. A while ago, the bears were delighted - and very shocked - to discover that they were restoring a bear from around 1912, one of the first bears to be made in England. Then it happened again! An old bear was found knocking at the door of Ambrosia Place in a dreadful state. Her ears had disappeared, her paws and hands were ragged and sore, she'd lost her growl, she only had button eyes and she felt awful. The bears immediately took her in and began work at once. Teddy's old and dusty excelsior was removed and, because she was going to stay with the bears, was filled with fresh clouds and steel shot. Her original growler was stuck back together (though it no longer worked) and was replaced in her tummy along with a new, hardboard one. She was given boot-botton eyes, had new ears pushed in to the extant seams, and her poor hands and paws were reconstructed and padded with soft felt. She felt absolutely glorious when she woke up. They called her Jacqui after a late friend, and she was given a pretty dress for the party that was happening that night to celebrate her joining them all! Can you see the beautiful rose she found in the flowery garden? Another bear in need of help soon arrived. Poor teddy was in a bit of a state. He'd lost his eyes, nose, outh and growl; his paws were very uncomfortable, and his face was all squashed out of shape. After he was fast asleep, the bears got to work. 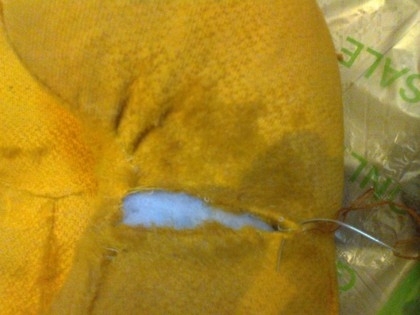 Soon he had new pads all rtound, new eyes, mouth, nose and growl, and his open seams were stitched. His face was re-shaped and his ears were sewn back on properly. He felt fantastic when he woke up! Very soon, another amazing vintage teddy came to the hospital for some help. His pads were all worn, his left ear was comiong off, and his nose had been kissed away. The bears set to work immediately. He was given lovely, new, velveteen paw pads; his left ear was secured, and he was given a new, felt nose to be kissed all over again. He felt extremely smart afterwards! Sometimes teddies come and you can't really see the problems because they're hidden. This poor teddy was a case in point. His joints were all extremely loose and one leg had alrady come off; his head was only stitched on, too. His left ear was coming undone, his left foot was wrecked and the poor chap had lost his eyes and his growl! Gosh. He was in a dreadful way. The bears started work immediately as poor teddy was extremely uncomfortable. When he was fast askleep, having drunk a flowery potion, the bears fixed his ear, and gave him new eyes. All of his joints were changed or tightened, he was given a lovely growl, and his pads were re-covered with thick velvet. He felt absolutely fantastic again when he woke up! And then a poor teddy arrived from France; he was in a dreadful state. His head was off and split open, his body and arms had collapsed and his feet were a mess. He felt awful. The bears rushed to help and gathered up all of the bits. When he was fast asleep - having drunk a special potion - they set to work. His head was stitched up, back and front, and re-attached to his body. Stuffing was added to his limbs and torso, and he had a lovely new growl. A new eye and an embroidered nose came next, and then he had beautiful new pads. He felt excellent when he woke up, and the bears all had a party for their new friend before he began his journey back to France! Then another wonderful Chad Valley arrived; he needed new pads, a new growler, his ear stitching back on, his eyes re-positioning and his poor nose re-embroidering. He didn't feel very sweet at all! The bears set to work to make him feel lovely again. He was given new pads, a new growl, secure eyes and ear, and his nose was made all kissable again. He looked like a prince when he woke up! And then a really lovely teddy arrived. He belonged to a lady when she was a little girl, and poor teddy was literally falling to pieces. One arm was totally off, and the other limbs were very close! There were huge rips in poor teddy's face, and holes on his hands and feet. the bears got to work immediately. Teddy was soon fast asleep, having drunk a flowery potion. 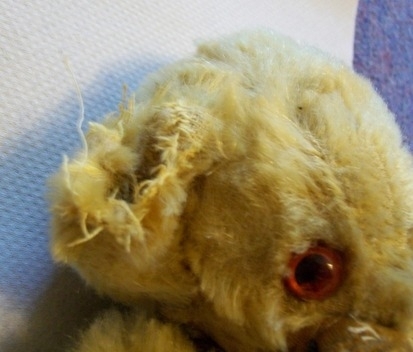 The bears stithced teddy's ears on more securely, gave him new eyes, re-mbroidered his nose, and mended his poorly face. His limbs were re-attached and all of his holes patched up. He felt grand afterwards, and threw his arms up in a cheer! Then a small bear, just a few inches high, arrived. Poor Edward's limbs were either off or about to fall off totaly. The bears rushed to help him. When he was fast asleep, they worked their magic; soon, Edward was feeling his old self again! When a splendid camel arrived, the bears couldn't believe their eyes. The camel only had one eye and was feeling very grubby and floppy. He was at least 55 years old. The bears took out all of his dirty excelsior stuffing, and filled him with steelk shot and clouds. He was given new glass eyes and a lovely jingly decoration. He said he hadn't anywhere to go, and the bears asked him if he'd like to stay with them. He said yes and danced until his bells nearly fell off with jingling! They called him Edgar. Isn't he lovely? Then a lovely horse dog on wheels called Arnie arrived! He was a bit grubby, and his poor tail was hanging off. There was also a hole in his forehead through which a lot of his wood-wool stuffing had escaped. The bears set to work straight away. When Arnie was fast asleep, he was given a lovely clean; his rail was stitched back on; his head was filled up with traditional excelsior and a little patch was put over the hole. He was brushed and brushed until he almost shone! He felt ready to go back home where his frame was to be painted bright red! Then a really huge teddy arrived. His arm had come off, his growl had stopped working, and he needed a really good clean. When he had drunk a flowery potin and was snoring away, the bears put him arm back on. He was given a lovely new growl and his fur was made all clean again. He looked extremely handsome when he woke up! Then the sweetest little panda arrived. His head was comning off, his arms were showing their metal joints and he was terribly dirty. When he was fast asleep, the bears gave him a lovely bubble bath, secured his head and made hi sporr arms all better again. He felt much better when he woke up! Then the most amazing rocking horse arrived at Ambrosia Place. The horse needed to be completely re-covered and have a new mane and tail. The bears couldn't believe it! They worked and worked and covered and stitched until the horse was beautiful again. She had a beautiful new mane, tail and eyes, and the bears sanded and re-varnished her rocker. She looked absolutely magnificent when they'd finished and the horse was overjoyed to give them rides! It's so sweet when teddy friends come to the hospital together. A gorgeous Chad Valley and his Merrythought friend both needed a bit of help. The wonderful Chad had worn foot pads so, when he was snoring away, the bears made them all better again. He felt lovely again afterwards! The little Merrythought had lost his voice, so he was given a new growler. Obviously, you can't see any difference, but he's growling away in the photo; just pretend you can hear him! And then an absolutely magnificent Chad Valley arrived! He was really big and had a chair all to himself! His pads were in a state, he'd lost his growl, he was feeling floppy and his left eye was literally holding on by a thread. The bears gathered round, gave teddy a hug and set to work. Soon teddy was snoring really deeply. The bears secured his left eye, re-blacked his nose, and added stuffing to the top of his torso and shoulders. Next, he was given a new growl, and all of his paw-pads were replaced. He was given an external clean and brushed within an inch of his life! He looked almost brand new when he woke up. What a very handsome chap he is! When a sweet little sheep - 50 years old! - called Baa Lamb arrived, the bears couldn't wait to help! She was all grubby and floppy and there was a hole beneath her little tail. When she was baaing softly to herself as a result of the sleepy potion, the bears removed all of her degraded foam and filed her full of fresh clouds. They stitched up her tear and found a real bell that jingled sweetly! Baa Lamb made friends with a Dean's Rag Book lamb that lives at Ambrosia Place, and Daisy Lamb gave Baa Lamb one of her flowers to remind her of their friendship! Isn't she gorgeous? Then a stunning Farnell Alpha spaniel pyjama case arrived. However, the poor dog had himself been attacked by a dog and his head was just gone. He felt dreadful. The bears set to work immediately. The spaniel had a drink which made him all sleepy and then he was given a lovely bubble bath. A new squeaker was put in to his tail, his holes were sewn up, and then he had a brand new head! His original ears were still fine, as was an eye. He couldn't believe it when he woke up! And then a huge teddy arrived; he was in a bit of a state as he'd literally lost his head - and his right leg! When he was snoring away, the bears put him back together. He felt lovely when he woke up. Then another very sad case arrived. The poor teddy had dragged himself all the way to the hospital and was in an awful state when he arrived. His fur was filthy, crispy and sticky; he had a few rips and he was very hungry. The other bears gave him a hug, and some bread and honey, and then set to work. The poor little thing easily fell asleep when he drank the potion and, while he was in the land of dreams, a wonderful transformation took place. The little bear was given a bubble bath, and he was re-filled with fresh clouds and sweet-smelling buckwheat. His holes were stitched up and he was brushed. He cried with joy when he saw himself, especially when the bears told he he was a beautiful Chiltern! He said he had no-where to go and the bears cheered because that meant Pipkin, as they called him, could stay at Ambrosia Place for ever and ever. They had a huge party to celebrate. Then another sweet teddy arrived. His head was very loose, his squeaker was no longer functional, and his pads were worn; his right foot was also falling to bits. The bears gave the little ted a sleepy drink and, when he was snoozing away, they fixed him. His head had a new joint, a new squeaker was put in to his tummy, his right foot was econstructed and he had new felt pads all round. He felt very handsome when he woke up! And then another really sweet little bear arrived; he was in quite a state! He had no insides, no face and no ears.The bears gave him a hug to make him feel safe and then set to work. Teddy was re-stuffed with fresh clouds, had new eyes, nose mouth, and new ears were made. He felt lovely when he woke up! Then an amazing Steiff bear on wheels - which was over a century old - arrived! What a wonderful visitor! He needed new ears, as the replacements weren't quite right, and his nose and claws re-embroidering. The bears set to work and soon he was looking very fine indeed! Then a much larger bear came to stay! He'd lost his eyes, growl and he needed new pads and a bit of help with his nose. When he was snoozing away, the bears gave him lovely new pads, put in new eyes, gave him a growl and re-stitched his nose. Isn't he a handsome chap? Teddies always seem to need new pads and various limbs re-attached. Tghis chap was no different! His head was literally hanging on by htreads where his family had desperately tried to stitch it back on. His growl had vanished and his pads were filthy; he was also rather grubby himself! When the bear was snoozing away, his growler was replaced and his head was firmly re-attached using proper joints. He was given new paw-pads and a thorough clean and brushing. He felt wonderful when he woke up! And then a very special bear arrived. Every now and then, a real piece of English bear history arrives for a bit of help. 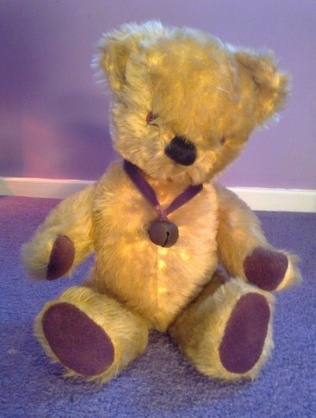 The bears guessed this marvellous teddy must date from the very early 1900s, when teddies first appeared in Britain. Her tell-tale hump had collapsed, her face had holes either size of her muzzle, her nose and mouth had half vanished and her poor legs and feet were in a right state. When she was sleeping soundly, the bears got to work. Stuffing was added to accentuate her humpo, her face was made all better and her nose and mouth were re-embroidered. She was given lovely new foot pads, and new claws were embroidered where necessary. She wanted to keep her woven hands as they were part of her character! Isn't she gorgeous? Then a really sweet teddy - who was going to be a birthday surprize repair - arrived. He was in a bit of a state. His growl was gone, his face was a mess, and his pads were ripped, as was his heel. The bears gave him a flowery potion and he was soon snoozing; they fixed his face, gave him a growl and sorted out his heel and pads. He looked fantastic and was so pleased when he woke up! Then a wonderful Chiltern arrived. He was someone's childhood friend and was in desperate need of help. His arms and hands were undtuffed and ripped, his face was a mess and he had several holes and open seams. When he was snoring away happily, the bears set to work. Teddy's arms and hands were re-stuffed and reconstructed; he had lovely new pads all round; hus face was made all better; his holes were stitched or patched, and he had a new nose and mouth embroidered. He looked extremely handsome when he woke up! Then a splendid challenge arrived! This poor tiger was well and truly falling to bits and there wasn't much holding him together. His owner was in despair and feared help was impossible. The bears never, ever give up on any animal that needs help, and set to work immediately. Tiger was given the special sleepy drink and he was soon purring in a happy sleep. His left front leg was reconstructed and stuffed, and he was filled where necessary with wood-wool. Then he was given a beautiful new coat made from velboa; he had new eyes, ears, nose and tail, and was given a magic kiss to wake him up. Gosh! Was this the same tiger? He felt amazing! Ambrosia and the bears spend an awful lot of their time helpinig toys who have been savaged by naughty dogs, and here was another casualty! Poor teddy had been completely deprived of his head and his limbs were either off or hanging on by a thread. They stroked him until he fell asleep (as he had no mouth to drink the special potion...) and then they set about their magical transformation work. 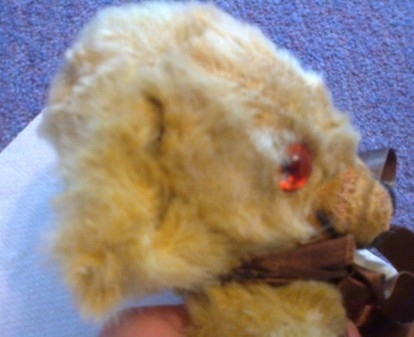 Teddy's limbs were stitched back on and then he was made a new head, with glass eyes and am embroidered nose. He felt absolutely wonderful when he woke up and saw himself with his new eyes for the first time! And then another poorly teddy arrived. He was in an awful state. His feet had been stitched up, as had his hands; he'd lost his eyes and nose; his voice as gone and he had a huge hole in his leg. Once he was fast asleep (the bears sang to him as he had no mouth to drink the potion), they got to work. Teddy's arms and legs were re-struffed and reconstructed; he was given lovely new pads all round. He was given a voice and his entire face was reconstructed: he now had beautiful glass eyes, and a nose and mouth. The gaping hole in his leg just vanished, as did the little one on his forehead. He couldn't believe his new eyes when he saw himself! And when teddy arrived home, he was kind enough to send everyone a lovely photo! And then a LeFray arrived; the bears couldn't remember one having been before, so this was quite special! Teddy Sam had lost ghis growl - and here he is after having had his new voice. You'll just have to pretend you can hear him growling away happily! Then a fantastic Golly arrived. He was in quite a bit of a state; he was many years old, was literally falling to pieces, and was absolutely filthy. His original green top and red waistcoat were under there somewhere, and the bears were determined to help. They gave him a hug and then he drank the potion, and was soon singing to himself in a lovely sleep. Then the bears worked their magic. He was washed and re-stuffed, and then Golly was given new hair, new trousers, and a new jacket. He looked beautiful again when he woke up! Then a really sweet little Steiff hare arrived. The poor little chap had been attacked by a naughty dog and he'd lost his head in the fray and was covered in rips. The bears gave him a stroke and a cuddle and, because he couldn't drink anything, they sang him to sleep instead. When the little hare was dreaming happily, they set to work. A new head as made, with new eyes and a mouth, and his holes and tears vanished as if by magic. When he woke up, he found he was extra handsome because of his bell and ribbon! He felt lovely again! The bears all have soft spots for Chilterns; they just can't help it as these bears are so sweet! So, when a lovely bear with no growl and only one eye arrived, they couldn't wait to get started. The teddy was soon sleepy from his flowery drink and, when he was snoring, the bears put in a new growl and made his loose eye secure and anbother magically appeared. He was given a lovely brush. He did look smart again when he woke up! Then another fantastic Chiltern arrived; this lucky bear lives on a river boat! His eyes were hanging off, he'd lost his growl, his pads were raggy and there were a few open seams. As soonas he was snozzing away happily, the bears got to work. His eyes were secured in the traditional manner, he was given a growl and extra stuffing to plump out his tummy, his seams were sewn and he was given new pads all round. He looked so handsome when he woke up! Then a huge teddy arrived. He was off to live in Cyprus and wanted sprucing up for his new adventure in his new home. Teddy's ears were coming off, he'd lost his glass eyes, his nose was frayed, his arms were floppy and he was feeling very grubby. When he was snoring away - having drunk the flowery potion - the bears set to work. His ears were secured and he was given lovely new glass eyes. The holes in his nose vanished and his arms were plumped out; he was cleaned as far as humanly possible. He looked very smart when he saw himself! 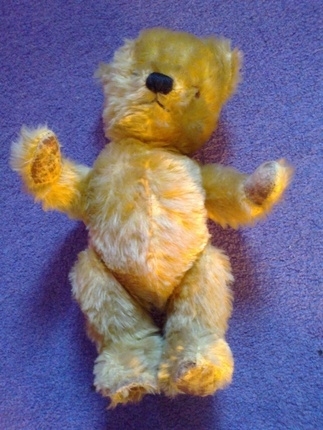 Another gorgeous teddy arrived soon afterwards. The poor chap had lost his eyes, his growl and his nose. His left arm was unstuffed and hanging off, there were a few ripped seams and his pads were worn. The bears gave him a cuddle and a special drink, and he was soon snoring happily to himself. Then the bears stitched up hgis rips, re-attached and re-stuffed his poorly arms and gave him new glass eyes. He also had a new growl and new pads. He looked wonderful when he woke up! The bears were delighted when a rather wonderful Wendy Boston tiger-cat arrived. Stripey had been loved so much that his face was falling off, and his pads were covered in holes. As soon as he was fast asleep, the bears set to work. Pudding searched the internet for pictures of what Stripey would have looked like originally; Ambrosia stitched on new pads and a face; Winterbourne drew new facial features and paw pads. Stripey couldn't believe his eyes when he saw his transformation! And then a really sweet little bear arrived from Dorset. He had been loved so much that he was in danger of losing his pads, his eyes were gone, and he already had a huge rip in his poor tummy. He didn'y feel good at all, so the bears set to work without delay. Teddy was soon sleeping soundly and the magic began. Teddy was given new pads, new eyes, a new nose and nmouth and a new squeaker. His tummy rip vanished! He was increadibly gorgeous when he woke up! And then a gorgeous Merrythought bear called Benedict arrived. He was in a dreadful state. He was filthy, his arms and legs had collapsed, and the poor chap had lost his growl. When he was snoozing away happily, the bears set to work. Teddy was so dirty that they had to remove all of his stuffing and wash him. He was then filled with fresh clouds and his growl was replaced; his arms and legs were filed and reconstructed, and lovely paw-pads appeared. Benedict looked splendid again! Then a really sweet teddy arrived. Little Tibby had been working as a spy for the government on top-secret assignments, and ran in to a bit of bother; he decided his 007.5 days were over and he wanted to settle down. The bears were more than happy to let Tibby stay at Ambrosia Place. He was washed and re-stuffed and brushed. he looked extremely handsome and is looking forward to his life helping other bears and toys. Then a fantastic lion arrived. He'd been in the wars and needed help with his face. He looked great when the bears had finished working their magic! Then a very old and completely flat panda came to stay. He wasn't feeling too good as his foot pads had bene worn away as well! When he wasa fast asleep, the bears gave him a bubble bath, filled him up with fresh clouds, and gave him new feet and a new bow. He did feel handsome when he saw himself! Then another very old teddy came to stay for a spell. He'd lost his pull-growl and he was feeling a bit grubby. The bears set to work. Teddy was washed and re-stuffed, and a new pull-growler was fitted. He was brushed until he was soft and adorned with a satin bow. He did feel lovely! Then a poor teddy hobbled in; his leg had come off and he was very sad. When he was asleep, the bears worked their magic and he cheered when he saw his leg all better again! And then another teddy came in with his leg off! What on earth was going on? The bears made him feel better with a hug and gave him the sleepy potion. When he was snoozing, they put his leg back on and gave him a lovely new growl. He felt great again! And then another splendid little Chiltern teddy arrived who needed a bit of care. When he was fast asleep, the beas put some more stuffing in his tummy along with a new growler. New paw-pads appeared all round as well as new claws and a new nose. He did look very handsome when they'd finished! Then another sweet reddy arrived with the usual problems. His eyes were falling out and his pads, although they had been re-covered, were feeling uncomfortable. When he was fast asleep, the bears secured his eyes so they'd never come out again, removed his old pads, and gave him some lovely new ones. He felt so much better when he woke up and saw himself! And then a Merrythought Cheeky bear came to stay. He had a hole beneath his shoulder, and some strange patches on the back of his head and ear. The bears soon mad ehim all better! Then a really sweet Steiff came to stay. She was feeling very grubby and her fur needed a clean; she was also given a new ribbon. Her owner wanted her feet left exactly as they were! Then a fantastic lion came to stay. He had a hole in his tail and, after the bears had worked their magic, it completely vanished! And then a lovely bear, possibly a French rod-jointed one from the 1920s/30s, came to stay. His poor right leg had come off and his left ear was coming away. He also needed a clean. Teddy felt rather wonderful after his treatment. Then a sweet bear arrived who was in desperate need of help. He had lost stuffing in his ankles, his paw pads were worn, his hands were sore, his right arm was almost gone, and he had no facial features. When the bears had worked their magic, he looked lovely again! Next to arrive was a gorgeous orange bear. He was very floppy, had several large rips and his hands and feet were sore. when he was fast asleep, the bearts set to work. Teddy had some more stuffing added to his tummy; his poorly ears were tidied up, the holes in his face and muzzle vanished, and he was given lovely new paw and hands pads. He felt lovely when he woke up! Then another gorgeous bear arrived; he needed new pads, a new voice and some other minor repairs. Once the bears finished, teddy looked in a mirror. He felt extremely handsome again! And then areally poor bear arrived. He was in a terrible state. His extant three limbs were only sewn on, his original pads had been covered up, his eyes and facial features were missing, he was all floppy and he'd lost his voice. The bears set to work immediately and did their very best for teddy. He looked fantastic once they'd finished. Then a sweet little Chiltern arrived, but he wasn't feeling well in the slightest! He was totally deflated, he'd lost an eye and he was filthy! The bears returned him to his original glory! And then a Chiltern from 1947 came to stayat Ambrosia Place for a while. He needed a bit of help. He'd lost stuffing in his limbs, he was full of holes, his pads were worn and he'd lost his squeak. The bears made him all handsome again! Whiskers the Bear had visited Ambrosia Place once before, and now he had come back to re-visit his old friends! He had a rip in his arm and he wanted some clothes; his owner had sent some camouflage fleece, so Ambrosia fixed his poorly arm and made him a onesie! Doesn't he look fantastic? Then another sweet teddy arrived. He needed a clean, a new squeak and his limbs secured. He felt an awful lot better afterwards. Then a really splendid bear arrived. Ambrosia and her friends were almost certain he was an American stick bear from the 1920s; how exciting! He needed a full restoration, and he looked extremely handsome afterwards! The bears love it when famous friends come to stay for a while, so it was a delight when Paddington arrived! He was sad, however, as a dog had chewed his nose and he was missing a toggle. He looked wonderful when the bears had worked their magic! Then a wonderful teddy arrived that the Ambrosia bears believed to be a Chiltern Hugmee. His head was off, he'd lost his growl, his pads were worn, his claws were gone and an arm was hanging on by a nail, quite literally! He looked fantastic when they'd finished. Then a sweet bear called Gregory arrived. He was in a dreadful state. His left arm was ripped open and was hanging off, he had lots of tears and he needed new pads. He looked like a little prince once the bears had finished! Then a little bear arrived. His rods were poking out, he needed a new nose and mouth, and his pads were raggy. He felt lovely after his treatment! And then another sweet bear arrived who was feeling very sad. His tummy was all flat and he had a large rip on his chest. The bears gave him a lovely bubble bath, filled him with fresh clouds and mended his chest. He looked very handsome afterwards! Then another marvellous bear came to stay. His leg was starting to come off, he'd lost his growl, and all of his paws were sore and losing their stuffing. The bears gave him a cuddle and set to work. He felt like a prince once they'd finished. Then another bear with poorly hands and feet arrived. He'd also lost his voice and his eyes were falling out. He looked wonderful once the bears had worked their magic! Then aother fantastic bear arrived. His face was gone, he'd lost his voice and his paws were very sore. He looked wonmderful once Ambrosia and her friends had finished! Then another poor teddy who'd been savaged by a dog came for osme help. Poor Edward was literally in bits. The bears did their very best, and soon he was lookign a lot better! Then a stunning Merrythought came to stay for some heklp. He was in qiuote a state. He'd been scorched at the back, he couldn't see, and his face was all sore. Once the bears had worked their magic, he looked extremely handsome again! Then two friends came to stay for a bit of help. Yellow Ted was falling apart and he needed a clean. He felt wonderful afterwards! Panda was also feeling pretty bad. He had torn joints, his pads were worn, he'd also lost his voice and he was feeling grubby. He looked extremely handsome when the bears stopped working. And then a huge bear came to stay. He had rips and tears, had lost his voice, and his pads were sore as well. The bears soon made him feel all better. And another gorgeous bear, called Edward, came to stay. His head had fallen, off, he had no eyes, nose or voice, and he needed a new hand; his feet he wanted left as they were. He felt lovely afterwards! 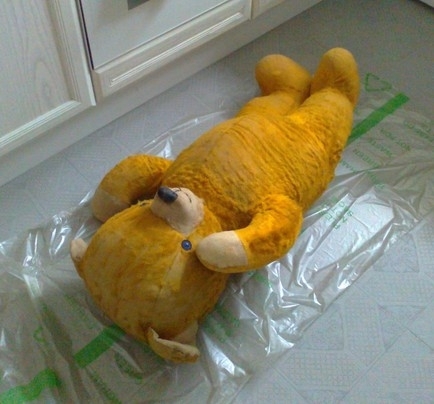 Then another vintage teddy in a sad state arrived. His ears were off, his face was ripped open and missing lots of material; he'd also lost his voice and his hands and feet were very sore. The bears worked and worked until the Haydon Teddy felt lovely again! Then another amazing bear arrived. He also needed a lot of help and felt wonderful after Ambrosia and her friends had done their very best! Then another gorgeous teddy arrived. He was feeling very poorly. His feet were sore, his face was damaged, he had holes in his chest and he just wasn't feeling sweet in the slightest. The bears made him feel wonderful again. Then a beautiful, huge Chiltern came to stay. Bobby couldn't lift his head, had sore feet and had lost his voice. He also neded a clean. He looked very handsome following his treatment! Then a really sweet bear came for some help. He could neither see nor smell, and his feet were sore. The bears made him all better again! Then a tiny teddy called Horton came to stay. His eyes and nose were gone, and his head was coming off. He looked like a new bear once Ambrosia and her friends had finished! And then Sooty made an appearance! He needed eyes, new pads and a squeak. Doesn't he look great? Then an extremely special old Chiltern teddy cam eto the hospital for a spell. He needed quite a lot of help, but he looked fantastic afterwards! Teddies alwasy seem to need new paw pads, and this is exactly what the next bear friend asked for - plus a new muzzle, new eyes and a bit more stuffing! And the next teddy needed the same treatment, plus a new nose! A lot of teddies come needing extensive work, and this little chap certainly felt much better after his treatment! And a beautiful teddy called Peggy arrived. She'd lost her head, eyes and her voice. She felt so much sweeter afterwards! And then another bear friend came for some help. Poor teddy had lost his ears, eyes, growl and his head was coming off! He also needed new paw pads and a clean. Doesn't he look handsome? And then a gorgeous white teddy arrived. He was all floppy and had a ripped groin. The bears made him feel better and he laughed so much that the photo tipped on one side! And then a really sweet bear called Derek came to stay. He's lost his eyes, his nose, and his arm. He wasn't feeling very happy at all. The bears all worked very hard to make him feel great again! And then another poor Chiltern bear arrived who'd lost his head and his leg. He didn't feel good at all. The Ambrosia Bears put him back together and gave him a wash. He felt fantastic once again! And a gorgeous Chad Valley teddy called Belinda came to stay. She neded quite a bit of help, but she looked and felt beautiful once Ambrosia and her friends had worked their magic! And a sweet little Pedigree came; her foam filling had completely degraded and she was verey flat. After her bubble bath, the bears filled her with fresh clouds! And then another very sweet teddy came to stay. He'd lost his eyes and his voice. Doesn't he look handsome in the 'After' photo? And then a teddy who had utterly collapsed came to stay. He needed a lot of help, but Ambrosia and her friends soon made him feel great again. Then Paddington came for some help! He was feeling poretty bad. The bears made him look brand new again! Then an amazing mouse called Bertie came to stay. He'd lost one arm, the other was hanging off, his neck was ripped and his clothes were filthy. The bears did their very best for him. Then a gorgeous Chad Valley bear came for a little bit of help. He needed new pads, a clean and his nose was sore. He felt lovely after his treatment. The bears always love it when Chilterns come to stay, and here was another one! He needed quite a bit of help, but he felt very handsome very soon! And then a sweet group of friends just turned up on the doorstep. They had nowhere to go and were all in a bit of a bad way; one poor teddy could no longer see at all, and his friends had helped him get to Ambrosia Place. They were all very relieved to find somewhere warm and friendly. The bears gave themn a cuddle and then set about making them feel better. The three were soon feeling absolutely fantastic and were over the moon when the bears asked them if they'd like to live at Ambrosia Place for ever and ever. They had a huge party to celebrate! And then an extremely old bear arrived. Teddi was at least 80 and was in need of quite a lot of help. The bears gathered round to hear his stories while the magic worked, and soon, he looked very handsome again! And then a teddy which the bears believed to be a LeFray arrived. Teddy had lost his arm and his growl; he also asked for new pads and a clean. Doesn't he look handsome? And then a Merrythought in a really bad state came for a prolonged stay. He was deaf and blind and was almost gone, but the bears NEVER give up. They brought teddy in and then set to work. Many days later, he had been completely transformed! And then another poor bear arrived. He'd literally lost his head and his growl was also not working. The bears soon made him feel an awful lot sweeter! And then a sweet Chiltern arrived to have a new nose and growl. He also ha d awash. Doesn't he look good? And then a Wendy Boston bear needing a bath and help with his nose came to stay. The bears did their very best! And then a darling bear named Tubby came to stay. He needed a lot of help on his hands and feet, and his nose was sore. Ambrosia and her friends soon made him feel all lovely again! And then another stunning old bear came to stay for a while. He had been loved almost to pieces. The bears worked and worked until Sid Bear was as handsome as they could make him. And then a beautiful Gabrielle Paddington arrived who'd had a terrible accident; his poor face had been burned by a candle flame. His hat was also burned beyond repair. The bears did their very best and soon had him looking all handsome again! Then a poor Wendy Boston bear arrived. He was feeling very grubby and very flat. Once the bears had worked their magic, he became his handsome self again! And then a really old teddy arrived. He was in quite a state. His face had worn away on one side, his pads were gone and he'd lost his voice . The bears soon made him feel fantastic again. And another very old teddy in a simialr state came to the hospital. He wasn't feeling sweet at all. The bears got to work and he was soon looking rather splendid! Lots of old bears seem to be arriving minus their limbs at the moment! Here's another one. Ambrosia did her best to make him feel all confortable again! And another bear with limb problems came to stay. he also had rather a lot of other issues and the bears soon made him look very handsome again! And then a sweet cat came to stay. His eyes were falling out, he'd lost his volice, there were split seams and his tummy was full of holes. Ambrosia and her friends set to work, and he was soon feeling lovely again! Then a sweet bear called Jimmy arrived. He'd lost his voice and his feet were falling to pieces. The bears soon made him feel all lovely again! Another very large teddy arrived in quite a bad state - he'd lost his head! He also had no voice, his feet were sore and he needed a jolly good clean. He did feel handsome once Ambrosia and hger friends had finished! Then a very old teddy in an extremely bad state arrived. He had lost his legs, and his hands and feet were sore. The bears soon made him feel an lot better! And another old teddy friend came for some help. He'd lost his eyes, and his feet had fallen to bits. The bears made him feel lovely again! And then a lovely old Chad Vaalley bear came to stay. His head was literally hanging on by a thread; he'd lost his eyes and his voice, and his nose was a bit sore. The bears soon had him feeling splendid again! Then a gorgeous panda who was 82 years old came to stay. He'd had a head replacement but just wasn't happy with it; he'd also lost all of his fur. The bears made a very strong magical potion - they were amazed with what happened when panda drank it! Then a gorgeous Chiltern teddy came for a rest and some help. He needed new pads, a new mouth and a new voice. He felt really great afterwards! The bears were delighted when a rather splendid horse on wheels came for a protracted stay. He was feeling very dull and asked if they could make him feel all sweet again. Ambrosia and her friends set to work; they didn't stop until horse looked and felt totally handsome! And then a gorgeous Austrian bear form the 1950s arrived. The little hole in his chest suggetsed he used to have a button, and Ambrosia thinks he may be a Mutzli, which is Swiss-German for 'little bear'! He wasn't feeling very sweet, so Ambrosia and her friends did their very best for him! Then a wonderful teddy called Frank arrived. His head had been sewn on crooked and was coming off again; he had no voice and he felt very grubby.The bears gave him their best spa treatment, and he was soon feeling fantastic again! Then a gorgeous little bear came to stay for a while; he was a shadown of his former self. He was flat, had lost his eyes, nose and voice, and his left arm was a mess. The bears gave him a cuddle and then made him all better! Then a sweet little Wendy Boston bear came to stay. His foam filling had completed degraded and was rock hard. He didn't feel very comfortable at all. The bears removed the old foam, gave him a bubble bath, and filled him with fresh clouds. Then they made his poor nose better. He felt lovely afterwards! And then a truly amazing little dog on a bike came to stay. He was feeling very old, was full of holes and rips, and he was falling off his tricycle. The bears gave him a bubble bath, and his hands, face and feet were suddenly brand new, as if by magic. The bears painted his tricycle and gave it a new pulling-string. He felt absolutely brilliant again! Then a couple of very old friends arrived. Donald wasn't feeling very well in the slightest, but the bears worked their magic! And little Pigeon, whom the bears believed to be a very old American stick bear, was literally falling apart. He felt very handsome again once they'd finished! Then another amazing bear arrived. He was in a bit of a state but Ambrosia and her friends soon had him feeling lovely again! Then another really sweet teddy arrived. His shoulders were ripped from being hugged too much and he was feeling rather dusty. The bears worked their magic, and soon he was feeling wonderful again! And a teddy is a really poor way came to stay. He was flat, had lost his eyes and ears, and his hands and feet were sore. The bears set to work immediately, and teddy just couldn't believe the transformation when he saw himself! Then another bear arrived and he was completely flat! The foam inside him had completely dinintegrated. The bears gave him a lovely bubble bath and filled him with fresh clouds. He felt wonderful again! Then two teddy friends came for a bit of help. Bif ted was feeling very unwell indeed. His face was very sore, as were his pads, and he couldn't move his head. Ambrosia worked her magic and soon he was looking very handsome again! Next up was Big Ted's little friend. He was feeling flat, was full of holes and his face was very sore, too! The bears soon had him feeling better! Then a really handsome bear called Benji stayed for a spell. He needed new pads, some help with his arms, and a nice clean. He felt wonderful afterwards! Then a really sweet little Steiff deer came for some help. Her left side was all torn and she wasn't feeling very well. Ambrosia waved her magic wand and the little deer looked so much better! Then a really gortgeous teddy arrived. She was feeling floppy, dirty and sore; she'd lost an eye, was full of holes and her ears and pads were all torn. She looked like a princess once the bears had worked their magic! Next, a handsome Chiltern came for some help. His joints were coming apart, his feet were sore, and he needed a clean. Doesn't he look handome? And then an amazing bear from Russia came for some help. He was feeling floppy, his ears, nose and mouth were sore, and he'd lost his voice. The bears listened to his fantastic stories while they fixed him up! And then another wonderful teddy arrived. Fred needed eyes, new pads and a new squeaker. He felt very handsome again once Ambrosia had finished helping him! Next for some help was a lovely Chad Valley bear called Frederick. He needed quite a lot of help; he felt very handsome afterwards! Then two teddy friends came to stay. The first one had lost his voice and his head was only balanced on the top of his head! The bears fixed his head and gave him a new voice. He did feel good afterwards! His friend was in just as much trouble! A naughty dog had chewed off his right ear; his arms and legs were all floppy and he, too, had lost his voice. The bears made him all better again! Amd another teddy arrived who'd been loved almost to bits! He had worn parts on his face where he'd been kissed, and his arms were falling off. The bers soon made him all better and ready for lots more kisses! Next to arrive was a poor bear called Edward Montgomery. He needed quite a lot of help; he felt lovely and handsome again afterwards! Then a wonderful French teddy came for some help. He was feeling flat, he'd lost an eye and his growl and was a bit grubby. He felt like a prince once Ambrosia and her friends had finished his treatment! And then an 84-year old teddy arrived. He was literally falling to pieces1 Ambrosia and her friends gave him a hug and then made him feel lovely again! And another very old teddy came ofr some help; he was going to be a big surprise for someone's 50th birthday! He looked really smart after Ambrosia and her friends had worked their magic! Next was a sweet bear called Bobby. His head was literally hanging on by some threads, he'd lost his growl, his hands and feet were sore, and he had holes around his joints. He felt really bad. Ambrosia and her friends gave him a hug and made him feel all lovely again! And then a splendid dog called Dallie - for obvious reasons! - came for some eyes and a new growl! He felt lovely again and kept barking happily at the bears! Then a wonderful old bear - he was 81 - arrived! He needed new eyes, a new voice, some stuffing, pads and a clean. He felt extremely young ands handsome afterwards! And another wonderful and very old bear came for some help. There was a real prince hiding underneath all of that age and wear; he couldn't believe it when he saw his transformed self! And another splendid bear came for a lot of help. He was literally falling to pieces; Ambrosia and her friends were as gentle as posisble, and soon had Mr Lancashire feeling much better! Then a wonderful Steiff tiger came for some help; he had a rip by his legs and was very uncomfortable. Ambrosia soon made him feel all sweet again and, like all cats, he loves his box! Next to come for some help was a gorgeous Chiltern panda. His eyes were falling out, he'd lost his squeak and he had a nasty rip in his tummy. Ambrosia and her friends got to work and mad ehim feel all sweet again! Then a remarkable bear came for some help. Ambrosia couldn't believe her eyes when she saw his chin button and then found a lead weight in his broken squeaker. Teddy was nearly 100 years old and a wonderful piece of English, teddy history from Chad Valley. The bears worked and worked and worked until teddy looked like a little prince, all ready for his 100th birthday! Then a sweet little cat came to stay. Her owner thought she may have been past hope, but there is usually always something that Ambrosia and her friends can do to help. Soon, the little cat was feeling all lovely again! Then a really gorgeous teddy came to stay. He needed quite a lot of help; he felt absolutely wonderful after Ambrosia had worked her magic! Ambrosia and her friends are always helpiung bears and animals that have been attacked by over-enthisiastic dogs - and here was another one! he was literally in bits. Ambrosia knew this one would be a real challange, but she never gives up! Teddy was soon back in one piece, looking a bit patchy, perhaps, but he was all the sweeter for that! Next to come for some help was Rajah the tiger. He was feeling floppy and had lost his voice. he was son feeling like a king again! Then another teddy came for a fantastic transformation! Then three friends came for some help. The first needed new pads and a new voice. He felt very sweet afterwards! Friend number two needed the same, plus some help with his nose. He did feel handsome afterwards! And friend number three was extremely special! Ambrosia was sure he was one of the very first Steiff bears from around 1915! The bears all gathered round to hear the tales this very old bear wanted to tell. He was soon looking much better, too! And then a tiny Steiff came for a spell. He'd been savaged by yet another naughty dog and his leg had been ripped off! Ambrosia soon had him feeling all lovely again! And then a teddy who had been repaired many times came to stay - for some more repairs! Daddy Ted was one of the most amazing patchwork bears that Ambrosia and her friends had ever seen. They helped out his face, gave him his voice back and some new pads, and patched up lots of holes. He felt much better afterwards! Then a poor Wendy Boston who had been savaged by a naughty dog came for some help. Ambrosia and her friends gave the lovely teddy a bubble bath and fixed her poorly face. She felt so much sweeter afterwards! Next was a bear who was literally falling to pieces. Ambrosia and her friends decided that the best thing would be to re-cover the bear completely. She looked like a little princess afterwards! And then Little Ted needed some help. He wanted all of his degraded foam removed and replaced with fresh clouds. Ambrosia was more than happy to oblige! And then another poor victim of a dog attack arrived. Mr Teddy had almost lost his head! Ambrosia didn't stop working until he looked better! And another wonderful teddy came for a bit of a re-vamp. He needed new pads and a clean. He felt lovely afterwards! Teddies always seem to need new pads and a nice clean, and that's exactly what the next chap received! And Ambrosia was thrilled when Paddington came for a complete revamp. he looked amazing after his stay at Ambrosia Place! Then a poor teddy minus eyes and ears came for some help. He looked extremely handsome after his spa treatment. And another poor teddy arrived; his legs had fallen off and he was very uncomfortable. Ambrosia made him feel all sweet again! Then another wonderful bear came for a spell. His leg had fallen off, his left paw was sore, he was grubby, had lost his voice, and needed new pads. The bears at Ambrosia Place set to work and did not stop until he was all handsome again! And yet another Paddington arrived! He needed a good clean, new foot pads, a new right eye and new clothes! He was soon all ready for his next trip to Darkest Peru! Then another poor teddy who was the victim of a dog-attack came for some help Fred Bear was a lovely Wendy Boston and he wanted to be all handsome again. Ambrosia and her friends did their very best, and soon Fred was looking as dapper as ever! Next, someone wanted a total transformation. Teddy was a pyjama case, but his owner wanted him changed to a normal teddy. Ambrosia did her very best! Next up for some help was Simon the teddy. He needed a wash anmd some new foot pads. Doesn't he look handsome? Then a really beautiful teddy with loads of potential came for the m,agic touch. The bears worked and worked, and soon he was utterly transformed! Then a sweet little bear came for some help. She was falling apart! Ambrosia did her very best! And another lovely bear came to have new paws and a wash. She felt lovely afterwards! The bears always love it when Chiltern teddies come for some help; this gorgeous boy was no exception! He needed a new squeaker, some help with his paws, and new pads all round. He felt very handsome afterwards and everyone had a party to celebrate! Then a gorgeous Chad Valley came for some assistance. Teddy needed a new voice, a clean and new pads. Doesn't he look handsome? And a poor teddy who had had both of his arms ripped off over 50 years ago came. One arm had disappeared, so Ambrosia made him a new one. He finally felt whole again! Next, a poor dog came. Dogs are usually the perpetrators of teddy carnage and rarely suffer themselves, but here was one! Ambrosia soon made him feel better again! Then a stunning 1920s German bear called Douglas came for some help. He needed some serious restoration work. He felt lovely afterwards! And a poor bear full of degraded foam needed a complete overhaul. He felt fantastic after his treatment! And yet another poor teddy was the victim of a dog attack. Jonathan had lost one side of his face and his muzzle was in shreds. Ambrosia gave him a cuddle and made him all better again!